Southern Oregon Shows Up In Force to say no LNG, no pipeline! The impressive community response to speak out against the proposed Jordan Cove LNG export project could be felt well before arriving at the Department of State Lands hearing on the evening of January 8th. At 5 P.M., cars were backed up several miles from the freeway exit to trying to access the Jackson County Expo, slowly making their way to the Padgham Pavilion where the Department of State Land (DSL) Public Hearing on Jordan Cove’s removal/fill permit was about to begin. But the lines didn’t end there! Ringing in 2019 with “Hey Hey, Ho Ho, LNG has got to go!”, over 1500 people lined up outside the pavilion to wait for their opportunity to speak. 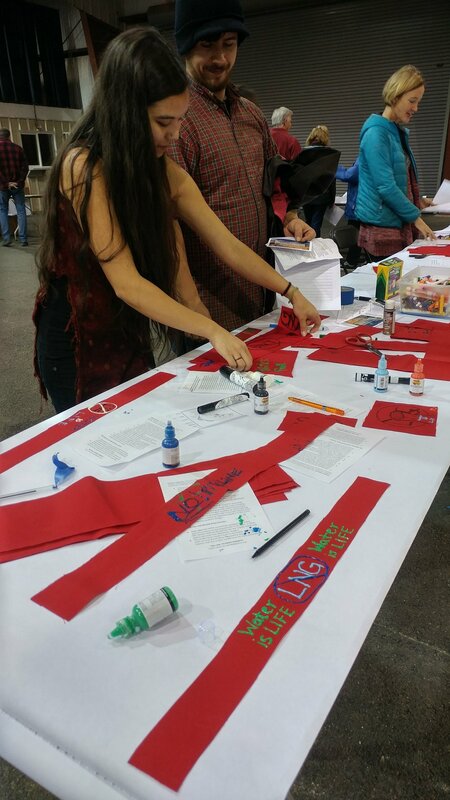 A peaceful, yet energetic crowd, the majority of attendees donned red gear to signify opposition to the proposed pipeline - a project that many of these people have been fighting for 14 years. But are they tired yet? Kinda. Are they giving up? Never! Community members showed up in force with the overwhelming message to DSL - The Jordan Cove LNG export project is bad for Southern Oregon. DENY THE REMOVAL FILL PERMIT! Jackson County was one of five Oregon locations to host a DSL public input hearing along with Klamath, Douglas, and Coos counties and Salem also hosting events. Attendance at all hearings was impressive with approximately 300 people in Klamath, 450 in Douglas, over 600 people in Coos Bay and over 300 in Salem. 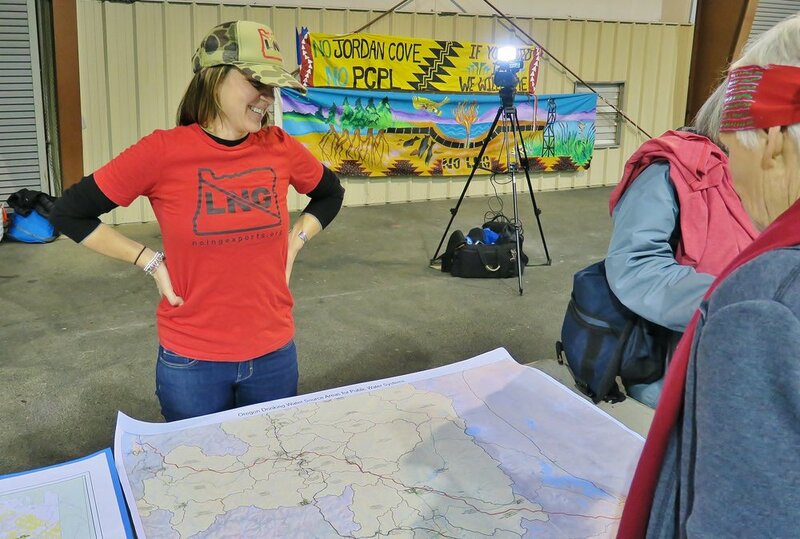 At each public hearing, the message remained clear - #StopJordanCove #NoLNG #NoPipeline. The ‘No LNG - Stop Jordan Cove’ rally cry brings together a varied demographic. Young, middle-aged, and elderly; working class and retired; cowboys, environmentalists, tribal members, fishermen, and recreators; politicians, technicians, and professionals - all sit side-by-side to defend the precious natural and economic resources of our land. Here is a general recap from the week! Klamath County DSL Hearing, Monday January 7th. 300 people in attendance, 70% in opposition. Jackson County DSL Hearing, Tuesday January 8th. 1500+ people in attendance, 90% in opposition. Coos County DSL Hearing, Thursday January 10th. 600+ people, in attendance, 70% in opposition! Salem DSL Hearing, Tuesday January 15th. 300+ people in attendance, 70% in opposition. Opposition is overwhelming not only in southern Oregon but across the state! The Department of State Lands open public comment period on Jordan Cove’s removal/fill permit ends on February 3rd so there is still time to submit comments! After the comment period ends, the DSL will take 30 days to review the thousands of comments submitted to make a decision to either approve or deny the permit. If they deny the permit, the project is dead. If they approve it, it can be challenged legally and then we’ll take it from there. If you live in the Rogue Valley or Upper Rogue Basin, we will be hosting a presentation and comment writing workshop in Shady Cove on Wednesday January 30th. Come on down, learn more, and get help submitting comments! There will be light snacks and beverages provided. Until then, stay tuned! No LNG, No Pipeline!